Before the turn of the century, mustang herds ran wild on the mesas near Dead Horse Point. The unique promontory provided a natural corral into which the horses were driven by cowboys. The only escape was through a narrow, 30-yard neck of land controlled by fencing. Mustangs were then roped and broken, with the better ones being kept for personal use or sold to eastern markets. Unwanted culls of “broomtails” were left behind to find their way off the Point. According to one legend, a band of broomtails was left corralled on the Point. The gate was supposedly left open so the horses could return to the open range. For some unknown reason, the mustangs remained on the Point. There they died of thirst within sight of the Colorado River. At first glance, Dead Horse Point appears to be a barren land, but it is teaming with plants and animals that have adapted to survive on a severely limited water supply. Many animals are nocturnal, coming out in the evenings when the intense heat subsides. Other wildlife and vegetation have dormant periods that vary with the limited rainfall. The Discover Moab website says, “The view from Dead Horse Point is one of the most photographed scenic vistas in the world.” My father pioneer landscape photographer Philip Hyde may have been the first to photograph Dead Horse Point in 1963. I have not found record of any other photographer having made a published photograph from Dead Horse Point of the Colorado River and canyons before 1963. Dad and my mother Ardis made their September-October 1963 Southwest Trip almost exactly a year before the original founding of Canyonlands National Park in September 1964. The park was already proposed, but a great deal of road building and damage to the land had been recently inflicted through the search for Uranium mining sites. Before exploring Canyonlands, Mom and Dad stopped at Arches, which at the time was a National Monument. They met with Russel “Slim” Maybery. They went to dinner with Slim Maybery and his wife Juanita. After dinner Mom and Dad watched Slim Maybery do a slide presentation on canyon country. Slim Maybery became famous as one of those who along with Bates Wilson led the campaigns to make Canyonlands and Arches National Parks. Slim Maybery also became famous for inventing the double slalom ski event. In those days many of the roads were extremely rough, primitive and only passable by 4-wheel drive vehicle. Mom and Dad drove their International Travelall into Canyonlands. The Travelall was like a large Suburban but with only 2-wheel drive. Dad arranged to have a guide in a Jeep named Tom Mulhern drive ahead. Whenever the going became too rough for the Travelall, Mom and Dad would leave it and pile into the Jeep and continue on. A number of Dad’s photographs from that trip later became part of the Sierra Club Exhibit Format Series book Navajo Wildlands: As Long As The Rivers Shall Run and one of the most well-known Sierra Club Books Exhibit Format Series volumes, Slickrock: The Canyon Country Of Southeast Utah by Edward Abbey and Philip Hyde. Slickrock helped in the campaign to expand Canyonlands National Park and Arches, as well as to make Arches a National Park in 1971. In Canyonlands they explored the “bays” of the White Rim, which Dad described in the travel log as, “A sandstone cap on a terrace which runs back to the talus slopes below the sheer cliffs of the plateau edge.” Dead Horse Point is on one end of these bays and Island In The Sky and Grandview Point are on the other. Mom, Dad and Tom Mulhern took off on several short hikes, or rather scrambles, down into the canyons. They also took the Jeep down a precipitous road that led all the way to the Colorado River. Who Photographed Dead Horse Point First? 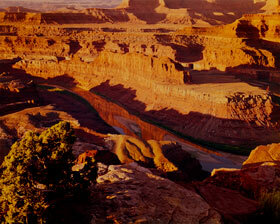 The first time I went to Dead Horse Point, which was around that time, I was working in Canyonlands for Ilford. The bridge going out to the last promontory at Dead Horse Point was really treacherous. I remember there were people who would drive up to it and would not drive across it. You’d go out there and there was this gap spanned by a hand made bridge with logs and planks over the logs, with no side rails. It was a natural corral. They didn’t have to fence it. When your Dad went out there, he had to cross that bridge. Knowing Phil he probably didn’t drive across, he probably walked across it. If you go down in my darkroom there is a panorama from Dead Horse Point, but it was mid 1970s by a friend of mine. I went up and camped out there for several days. I photographed all around, but I didn’t photograph the view. For some reason or other it just didn’t click for me to do it. The big scene is not that high on my list, but I was very taken with Dead Horse Point. I loved the solitude of it. Besides the fact that you could walk all around the rim of it and in every direction was something totally different. For many years there has been a campaign to make Dead Horse Point part of Canyonlands National Park. Al Weber said, “They will get it, but that will be too bad because the next thing you know there will be a freeway out there.” The formation of National Parks often results in another type of over-development brought on by heavy visitation. Today, the campground at Dead Horse Point still has limited water and only 21 spaces. Now for the contest… The New Dead Horse Point Contest is simple. Anyone who finds and can show proof of a photograph made before 1963 and published before 1969 of the view of the Colorado River and part of Canyonlands from Dead Horse Point, black and white or color, either through a website link or written copy of the image and verifiable date from a credible source as defined by me, will receive an 11X14 Philip Hyde authorized archival fine art digital print of any image of choice we are printing on the Philip Hyde Photography website, a $450 value. One person can win more than one print if he or she finds more than one photograph of Dead Horse Point made before 1963 and published before 1969. Also, there can be multiple winners, if multiple photographs meet the criteria. The contest will not go on indefinitely, but the ending date is unknown as of right now. The contest may end suddenly without any prior notice. Please report your progress and findings in the comments below.